Claude Chabrol’s second film follows the fortunes of two cousins whose bond is tested by a beautiful woman. Charles (Gérard Blain), a hard-working student who has arrived in Paris from his small hometown, and Paul (Jean-Claude Brialy), the dedicated hedonist who puts him up, are opposites in many ways. Despite their differences in temperament and ambition, the two enjoy a close relationship. However, when Charles falls in love with Paul’s friend Florence (Juliette Mayniel) the foundation of their friendship is posed a stern question. Made barely a year after Claude Chabrol’s debut Le Beau Serge, Les Cousins featured the earlier film’s same starring pair of Jean-Claude Brialy and Gérard Blain, here reversing the good-guy/bad-guy roles of the previous picture. The result is a simmering, venomous study in human temperament that not only won the Golden Bear at the 1959 Berlin Film Festival, but also drew audiences in droves, and effectively launched Chabrol’s incredible fifty-year-long career. 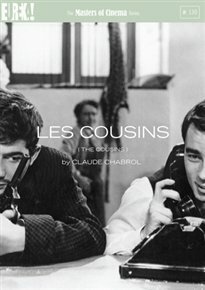 In Les Cousins, Blain’s character journeys from the country to Paris to crash at the luxurious flat of his worldly and decadent cousin, portrayed by Brialy, during the study period for an upcoming law exam which both have set out to undertake. It becomes clear soon enough that only one of the cousins is terribly committed to his work; as sexual promises and alcohol intervene, the set-up becomes untenable for the provincial, — and a tragic slide ensues. A gripping and urbane examination of city and country, ambition and ease, Les Cousins continues to captivate and shock audiences with its brilliant scenario, the performances of Brialy and Blain, and the assuredness of Chabrol’s precocious directorial hand. The Masters of Cinema Series is proud to present Claude Chabrol’s breakthrough film in a beautiful new Gaumont restoration on Blu-ray and DVD for the first time in the UK.